How did people retain their cash flow after their value plummeted? Jack: Hey, there. Jack Bosch here with another one of our podcast snippet episodes. This one is not going to be very long. 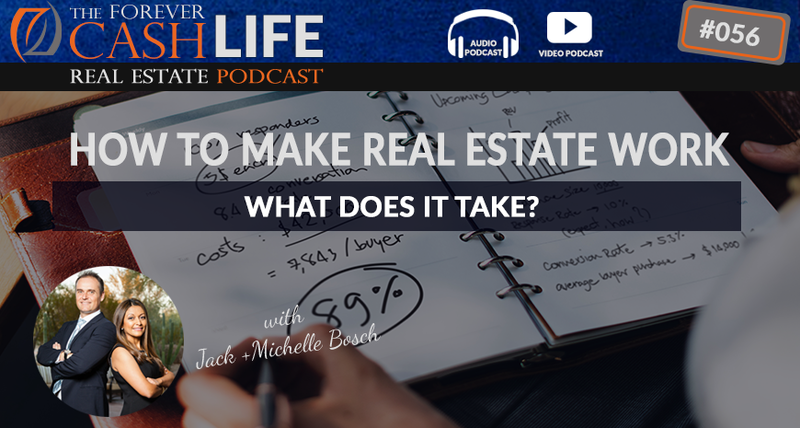 It is going to be a little bit about the rant about what’s important in real estate and what methods, what do you need to do to make your real estate work, right? This is the subject, how to make real estate work? What do you need? What do you need to focus on? Where do you have your highest chances? What does it take, and what your mindset needs to look like? I’ll see you right after this little session. Announcer: Welcome to the “Forever Cash Life Real Estate Investing Podcast” with your host, Jack and Michelle Bosch. Together, let’s uncover the secrets to building true wealth through real estate and living a purpose-driven life. Jack: Hey, there. Jack Bosch here, and welcome to another one of our snippets here. And today’s snippet is about how to become really successful in real estate. So here’s the deal. Michelle and I, we have been successful in real estate since the year 2002. But we took us actually a few years to get successful in the beginning. It didn’t start right away from day one. It took us a while to get there. And I wanna quickly tell you what I have seen since then. We have been teaching this to thousands of students, right? We have developed this real estate investment technique that has nothing to do with houses, that has nothing to do with rehabs, and where you can make the same profits that anyone else can make in real estate just without competition. And as the market roared up from 2002 to 2007, everyone was making money in real estate, right? But really, the group of real estate, and I almost sound like I’m stuttering, the group of real estate people got split into basically the winners and the not-so-fortunate when 2007 came around, right? All of a sudden, the music stopped and there were not enough chairs for everyone left to sit on. So, a lot of people left were standing with their pants down basically and losing everything because they had just bought properties on speculation, not on fundamentals. So one of the things I’m gonna talk right now about is how to become a real estate investor by focusing on the fundamentals, by focusing on the numbers and by focusing on your mindset, because if you understand the rules of real estate, then you will have such a greater chance of being successful in real estate. So, therefore, the first thing…so when that’s happened, all of a sudden, those who were operating on fundamentals were able to pretty much cruise through the crisis, and those that operated on sheer luck and sheer on their presumption, assumption that market prices would continue to go up, they got hurt. They got hurt and they ended up losing anything. So in our case, we have been investing in land. Out of all things, right? Land is one of the first ones to actually go down in the market. Like when a builder stop building, when the Smart Money stops buying houses, what happens is the builders also stop buying land, and as a result, the land then starts crashing. At the same time, when the market comes back up, the land usually comes a little bit after the houses because houses pick up and then the builder start realizing, “We can build again,” and they start buying. We have been flipping land since 2002 and still doing this today. The thing is when you work on fundamentals is that you don’t buy something at market value in the hopes of it going up. You’re buying at a number that makes sense no matter what the market is doing, right? You’re buying at a number that makes sense. So when we buy our properties, or pieces of land, or lots or infill lots, and our stuff at 20, 30 cents on the dollar, or sometimes even 10 cents on a dollar, it doesn’t freaking matter what the market does and you can still be successful. So therefore, let’s see, when the smart people in a real estate market that is on the peak, they’re starting to look away from rehabbing because rehabbing you buy something, you put money into it, and you have to assume and hope, because it takes three to six months to get a house rehabbed depending on how fast you are, some guys are really much faster even. But it takes perhaps a holding purse a period of four to six months, you got to calculate. You got to fairly be confident that the market in four to six months is still at the level that it is now or slightly above for you to be able to make money on that rehab. If you cannot count on that, then you need to be away, step away, from rehab. Wholesaling, on the other hand, always makes sense because the wholesalers usually don’t even take title to the property. You put a property under contract for $70,000, it’s worth $130,000, and you sell it for $80,000 to somebody. Make a quick 10K and move out of the deal. But you assign the contract, you do a double-closing, bottom line, you don’t need to be in the deal. And the holy grail of deals is when you can get into a deal at 10, 20, 30 cents on a dollar, still wholesale it at 50, 60, 70 cents on a dollar, go make a big spread in the middle. But if the market gives in in the meantime, worst case scenario, you buy it at 20 cents on a dollar, you still sell it at 40 cents on a dollar, you still doubled your money on those deals and it doesn’t matter what really the economy does in the process. So that’s the thing. So in order to be successful in real estate, you got to be investing by the fundamentals, not by the hope or because everyone in the brothers in real estate. You got to think about it and you gotta pick something that has fundamental value. For example, rental houses, when the market crashed, those who bought rental houses on the top of the market probably lost their share. They lost their share, right? Why? Because they bought $300,000 rental houses with a $1,500 mortgage that rent for $1,000. So they are running a negative cash flow in a month. And unless you have unlimited amount of resources, if you have 20 of these houses and you’re having a negative cash flow of $10,000 a month, then you can only hold that and sustain it for so long. At some point of time, that’s gonna bleed you dry. So that’s what happened to a lot of people. That’s why they let these properties go and they’re chosen for closures and all this kind of stuff, right? However, those that bought perhaps in either they got in a secondary or tertiary market where the prices were not as crazy, or they bought perhaps early on, where they bought $150,000 house with a $700 mortgage, then also rents for $1,000, those guys, they were able to cruise through the recession because they were able to just, yeah, they were able to have positive cash flow. Then what happened to them is, yes, the value of their property plummeted, perhaps even $150 to $50,000, but their cash flow stayed. So they were not forced to take any action, and as a result, they were able to move through that crisis just fine. When the markets rebounded, at some point of time, prices went back up to 150, perhaps 170 or so on, and then they went and if they wanted to get rid of the property, sell it then. And they had made cash flow all along. So again, you gotta look at the fundamentals. You got to learn the fundamentals. So, like, the reason why we now invest in apartment complexes is because we can make the deals fundamentally work. The reason why we have to look at 100 to buy one of them is because 99 of them, the fundamentals, don’t work. Yet, somebody else is still buying them. Somebody else is still buying them because they’re either happy with a very low return or they’re hoping for something that might or might not happen. And if they’re lucky, they’re gonna make a lot of money. If they’re not lucky, they’re gonna lose a bunch of money. And you know what? I don’t wanna invest in real estate based on luck. Luck is not a strategy, hope is not a strategy, right? So these are some of the things. But the main piece behind real estate investing is that you gotta understand that you have to be patient. You gotta understand that there’s a mindset around it, that when you see the big checks fluttering around from the gurus and you see the checks from other people, from infomercials and things like that, what that means is that those checks are done by the people who actually understood that real estate is a business, right? It’s a business. Within that business, you got to pick the pieces, the niche that makes most sense where you have the biggest fundamental benefits, right? For example, when you can buy these properties for cheap, sell it for high and do even seller financing with them and get your money back when they give you a down payment, right? You take a $50,000 property, put them on the contract for $8,000, get a 20% or $10,000 down payment when you sell it, and then get a $40,000 loan that people pay you, where you become the bank, well, that is a fundamentally sound deal because what happens if that person pays for two or three years and we hit a recession and they can’t pay any more, then if they give the property back to you, you already have made your money two or three times. You get a free and clear property back that already generated you probably $10,000 or $20,000 in profits and now you can go resell it, or you can do a loan modification with them, and so on. So again, if you go into fundamentally-sound investments, they will survive all those things. But the key is you got to understand that it’s a business, and a business needs to be fueled by marketing, a business needs to be fueled by engagement, right? You can’t just send out a few letters or post a few posts and then expect the next morning to wake up being wealthy. It’s a long-term game, right? It’s a long-term game. Even there, of course, you wanna look at different kind of things. When we got into multifamily, it took us almost a year to find our first solo deal, right? And once we found that solo deal, it takes another three months to close that deal. So if you don’t have the stamina to wait 15 months to get your first multifamily deal, then you shouldn’t perhaps get into it in the first place. But if you understand that, now, on the land side of things, you know, lot and lot flipping side, it happens much, much quicker. And there’s much, much complexity involved. It might be as quick as getting a deal in the first six weeks but it’s still gonna take six weeks. So if you’re expecting… or eight weeks or something like that. But if you’re expecting to get a deal the week after you get into a program, then you are basically, again, hoping for luck. And luck is not a strategy and hope is not a strategy. So you gotta understand that it’s a business. But I always wanna compare it to the example that I was bringing up, like a franchise. Like you wanna get into a franchise that is fairly easy to get into, let’s say a Subway franchise store, that doesn’t cost like McDonald’s. It cost multiple millions of dollars. So Jack in the Box cost multiple millions of dollars. But if you wanna get into something like a Subway, it only cost between $250,000 and $400,000 to open your own Subway. In a sense, Subway, which is recently closing sub-stores, but still, within the areas they are expanding, if you wanna be a franchisee, that’s what it costs. Now, you can borrow a lot of that, but then, you have franchise fees that you have to pay. So at the very least, you’re out $50,000 in cash. Otherwise, you shouldn’t even start it. In others, $50,000 in cash, you’re now gonna make something like… you have all these payments and all these things and you’re gonna make perhaps $4,000 or $5,000 a month in income. But you have to be there every day. You have to run the shop every day. You have to close the door, open the door, do accounting, do bookkeeping, do things, all this kind of stuff for that. So it’s a major financial commitment. The investment is $400,000 and you make 50K a year. Well, and it also doesn’t happen overnight, right? You got to negotiate the franchise agreement, you gotta get it all signed, you gotta find a location, you got the location needs to be built out, you gotta get trained, you gotta hire your staff, and then you’ll open it. So it’s probably, I would think probably at least a year, between wanting to start a franchise like a Subway franchise and you actually opening the store. So business takes time to build. I’m sorry to crack that to you, but business takes time to build. And if you don’t have that time, if you’re not willing to take that time, then perhaps you shouldn’t be in business, right? Now, the good news is, again, our land flipping stuff is the simplification of all of that. It still takes time but it doesn’t take a year. It doesn’t take $50,000. We have students that started for literally 500 bucks, 500 bucks in marketing budget or 1000 bucks in marketing budget. And a few hours a day, one of our first students wins. All he ever did was do this business Thursday evening to Saturday morning. And in 15 months, he did 19 deals, making $400,000, right? So you can do it, but have you heard me? He didn’t make $400,000 in one week. He made by consistently applying two days a week, three hours a week, three hours each. He was able to get $400,000 in 15 months. So if you’re not willing to spend 15 months, then you should perhaps rather go, go on garage sales and sell the stuff on eBay. That’s how we can make a quick 50 or 100 or 1000 bucks. It’s not necessarily scalable over time, but you can make…I’m sorry, you can make a few bucks doing it that way. So bottom line in real estate, to be successful, you have to have the mindset of focusing on the fundamentals and be focused on getting line and stay in line as I call it. Pick one thing, eliminate all distractions, and then go learn what it takes to do it. Schedule your week around it and make sure you have consistent time for it. And then keep your heads down and keep going at it. Your success might come in the first week. It might take you three, four months to have the first success. Usually not, but with using our land technique, most people are successful. If they’re doing everything we’re asking them to do, they have their first deal in the first six, eight weeks. They have their first deal sold a few weeks afterwards. And then you repeat that cycle. Now, if you do this in the housing world, it might take you six, eight months to find your first deal because there’s so much freaking competition. But if you wanna do houses, you can make it work. I have plenty of friends that do 300 house flips a year, 300 wholesales a year. They’re making it work, that means you can make it work. Just pick the model that is most appealing to you. If you wanna find out more about ours, you can go to our website, which I got to put the link below. But we’ve got to probably put it on here too, landprofitgenerator.com or you can go to jackbosch.com/land. And we’ll put the links below there. And you can find out more about this, there’s some free videos and things that you can watch about that. But the key is, like any other business, real estate is not a get-rich-quick program. It is something that requires work and dedication. But I’m telling you what? It’s the most fun you’ll ever have. And the checks you can make are the biggest you’ve ever seen in your life if you put in the work. All right, thank you very much. That’s what I had right now for the snippet. I’ll see you soon with another one.